In this modern Mobil-home of 29 m2, you can stay with your family. It is indeed perfect for a group of 4 to 6 people. Moreover, like all the cottages of this 5 star campsite Sunelia alum vacation, this model has all the facilities useful for spending a pleasant holiday. It can be rented for a weekend outing, for a few days of discovery or even for a week or more. All tenants who opt for this model of mobile home Sunêlia Comfort 4/6 People are entitled to 2 spacious and comfortable rooms. The first one has a double bed and the second is equipped with 2 single beds. This cottage also has a dining area with a seating. The latter is convertible into a bed for two people if necessary. On the kitchen side, the kitchenette is equipped with all the utensils necessary to prepare meals. It also has a lot of crockery and appliances of all kinds. There are, for example, cooking plates, a refrigerator, a microwave etc. In the bathroom, residents are entitled to a shower and a sink. The toilet is independent. The whole house is air-conditioned and is equipped with heating. A safe is also made available to residents in case they have valuables to keep safe. In this accommodation, you can also house pets outside categories 1 and 2 under payment of an extra charge of 6 euros per night and per animal. If the holiday makers do not want to take the sheets and towels, they can rent it once there. All they have to do is apply to the campsite's reception. Similarly, they can also make a housekeeping reservation at the end of their stay. 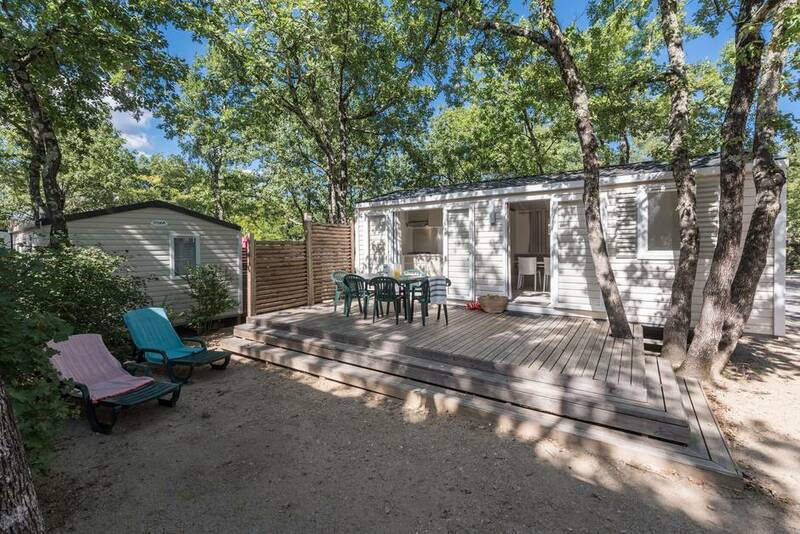 By renting this modern Mobil-home of 29 m2, one can enjoy the stay with the relatives. So we can do all the activities offered in the 5 star campsite together. Children can be assisted when they play in the playgrounds or when they are at the children's Club. It is also possible to do the nautical activities together. The water park is made up of several spaces made to match the needs of everyone. There are corners for big people and there are parts made for children. We can also meet together on common areas like the restaurant. We just have to book a table and take snacks, order dishes etc. Even the camping bar is open for the whole family. You can order alcoholic beverages or cocktails for large people and fruit juices or alcohol-free cocktails for children. If you want to go out in a group, you can rent bikes for everyone. There are models suitable for all ages in the campsite.